First cataloged by E. E. Barnard (Barnard 33) in 1919, this absorption (dark) nebula is located below the most southern belt star of the Orion Constellation. Obviously, the name Horsehead Nebula is derived from its appearance. It is estimated that one million of our solar systems could fit into this dark area. Tere are basically four types of nebula or gas clouds. The first, which I discussed in a previous article, is the emission nebula. That is, a nebula that emits light. The second is planetary or super nova type, which is gas that has been blown off due to the ageing process of a star. The third is absorption, which absorbs light due to its make up of dust or dense gas. And lastly, reflection nebula that reflects light. This image shows three different types of nebula. The background cloud is emission. The Horsehead Nebula is made up of dust and gas that does not emit or reflect light; hence, dark nebula. Notice the shadow below the muzzle indicating front lighting. Thus, you have reflection nebula added. Look closely and you will see dim dark streaks radiating up on the photograph. These streaks are thought to be caused by a magnetic field from the Horsehead Nebula. 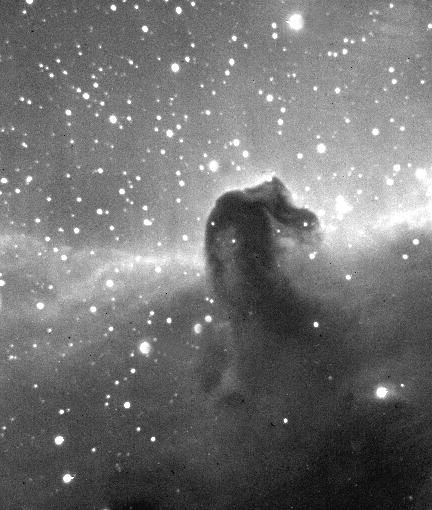 In combination with its distance of 1,600 light years and a moderately bright emission nebula as a background, the Horsehead is very difficult to observe through a telescope. I have scarcely seen the Horsehead Nebula a couple times in just the largest of amateur telescopes fitted with special filters ... and then it was barely perceivable. Only through the ability of extremely sensitive CCD cameras, utilizing time exposures to collect the very small amount of light, can we finally appreciate the many distant beauties God has created. Astronomy 1014 will be offered in Nashville at CCCUA this fall under Dr. David Rauls. The course will cover introductory astronomy. Limited enrollment, so register early.